Sitting in my sunroom looking outside, I notice the leafless trees, snowy ground, squirrels eating seeds from my birdfeeder, and the presence of neighbors’ homes. I long for spring flowers, warm weather and longer days. But I must patiently wait another three months for those things. This is winter life in New England. However, you can make a few modifications to your surroundings if you enjoy having and appreciating flowers during winter months. Bring your flower pots inside and place them near south facing windows. 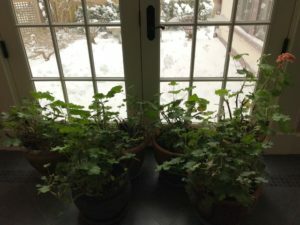 Plants such as geraniums, hibiscus, Jasmine vine, citrus and herbs (like rosemary) can tolerate the indoor climate during winter months. I usually bring the flower pots and shrubs indoors the end of October. Prune the long, leafy branches and give them a dose of fertilizer. 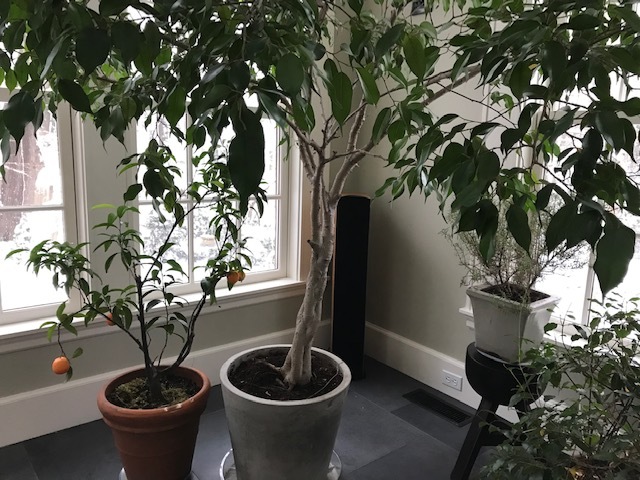 During winter time the plants become more dormant and don’t require too much watering. Keep them in the area that the temperature does not fall below 55 degrees Fahrenheit and preferably in direct light. Plants like orchids do not like direct sun, so keep them in indirect light and give them one ice cube every week. Plant indoor bulbs such as Amaryllis, narcissus (Paper White) or Hyacinths and they will give you fragrant and bright flowers. They are easy to grow, and they require anywhere from 3-8 weeks to force bloom. You can buy the bulbs at any home improvement centers or on-line. 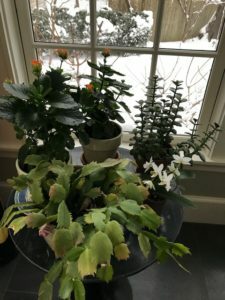 Another easy and low maintenance plant with colorful flowers is Christmas cactus which usually gives pink or red flowers around December or January months. Explore indoor gardens and museums in winter time. Isabella Steward Gardner museum in Boston with a wonderful courtyard is one of my favorites. They have hanging nasturtiums that are must-see exhibit in March/April months. The nasturtium vines have cascades of orange flowers that are twenty feet long and hang down the windows in to the courtyard. Another favorite is the Lyman Estate green houses in Waltham. They have an amazing collection of Camellias that date back to late 1700’s and bloom in late February or early March. In addition, Wellesley college also has a beautiful and very large greenhouse that is currently under renovations. Both the Lyman Estate and Wellesley College greenhouse are free to the public. Next time you are feeling cabin fever and cannot escape to a warm climate please consider one of my suggestions. There is no better remedy for the winter blues than the smell and sight of flowers and greenery. By Dr. Peiman Mahdavi, D.M.D.